A week ago I linked to a story about the history of World Cup soccer balls, so I feel I must follow up. 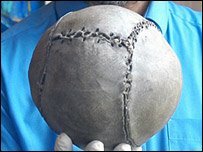 The world's oldest soccer ball (pictured) is on it's way to Germany where it will take part in an exhibition on the history of the sport during the World Cup. The ball is 450-years old and was once the property of Mary Queen of Scots. The 16th century ball is made from a pig's bladder and the cover constructed from pieces of thick leather, possibly deer, and tightly laced together. If I recall my soccer history correctly, at that time the game was not an 11 on 11 affair. Instead, whole towns would compete over fields that stretched anywhere from thousands of yards to many miles with the whole thing sometimes lasting for days. An just look at the stitches on that thing. Must of made headers an experience. Do you know wahat it is filled with? Like in 1004 b.c japenese would will a bladder with human hair. Please visit the below website and you will find the truly Oldest Soccer ball in the world. Jugar juegos de frozen en línea gratis, los nuevos de princesa de Disney frozen - la princesa encantadora y linda. Divertirse juegos frozen! What is Mexico's World Cup roster worth?